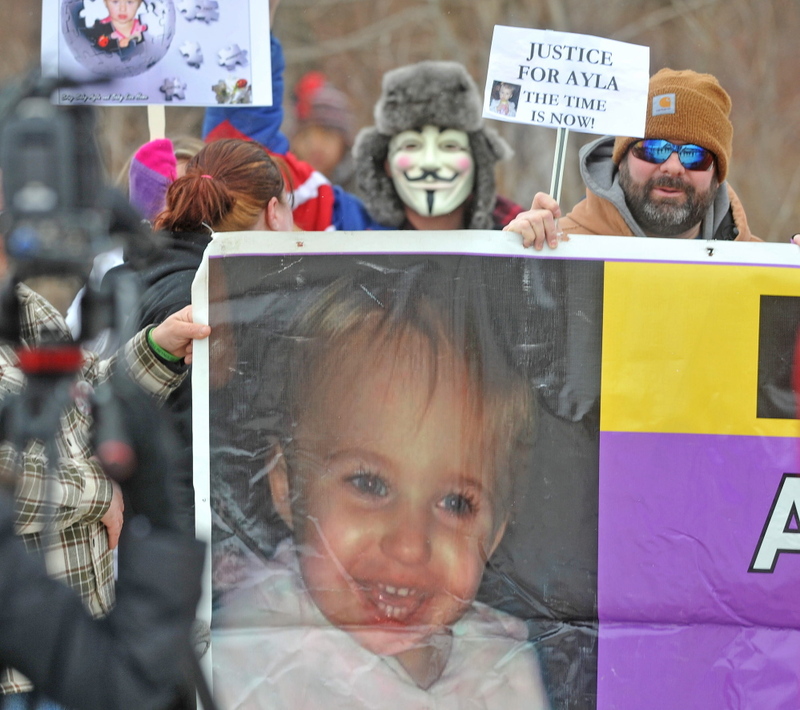 Group demands criminal charges be filed against the last people to see Ayla. 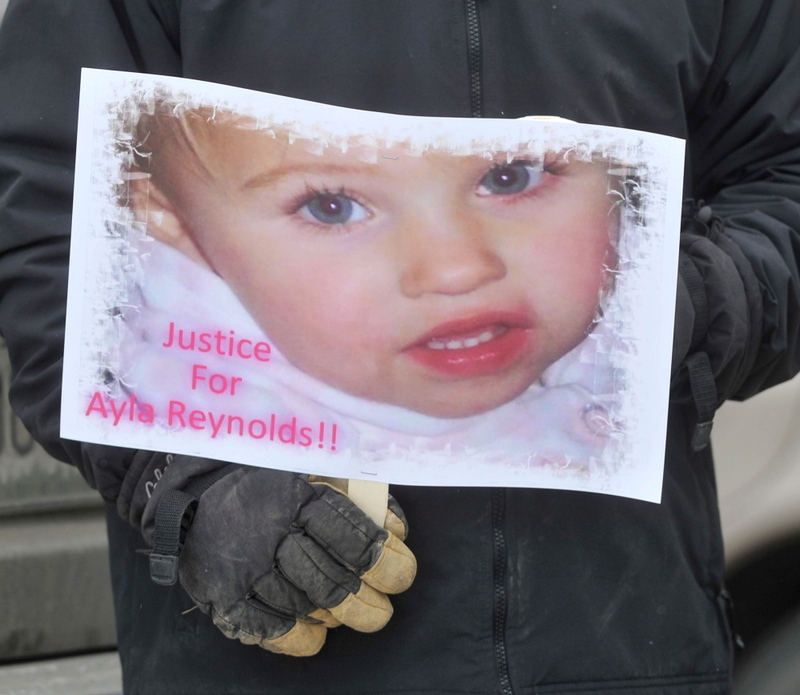 WATERVILLE — More than two years after toddler Ayla Reynolds disappeared, the pain is still raw for her grandfather, Ronnie Reynolds Sr.
Reynolds, of Portland, was speaking Saturday outside the police station, where about 35 people had gathered to urge authorities to file criminal charges in the case. “As her grandfather who loves her and misses her every day, as long as I’m alive, it will never go away until justice is done,” he said. About 20 searches over two years have turned up no trace of her. For Ronnie Reynolds Sr., who believes Ayla is no longer alive, the pain of loss is mixed with anger that she was taken from him and his family. 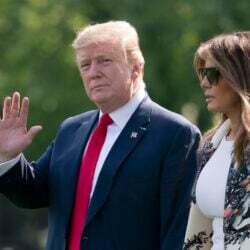 It also is mixed with a deep sadness that causes him to break down as he talks of his blond-haired, blue-eyed granddaughter. He arrived at Saturday’s event with his daughter, Trista Reynolds — Ayla’s mother — and Trista’s stepfather, Jeff Hanson. Hanson and the Reynoldses said they did not organize the event but wanted to be there to thank and support those who turned out in the bitter cold to remind people that it has been two years and the case remains unsolved. Trista Reynolds said when she starts to lose hope, she remembers the people who have never met Ayla but continue to fight for justice in the case. “I think it’s absolutely amazing,” she said. She said she is grateful for police and game wardens who have searched far and wide for her daughter and continue to investigate the case, but she is getting impatient. 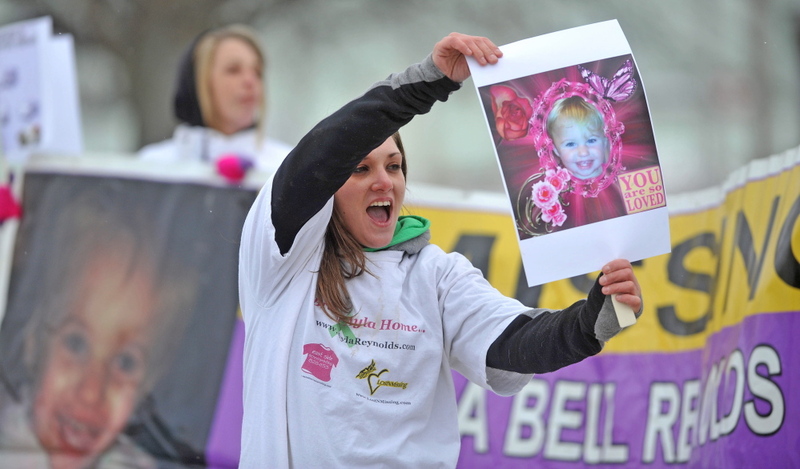 Hanson said Saturday’s event keeps Ayla’s case in the spotlight and is a reminder that time has dragged on. “We’d like to see this move forward,” he said. The event drew some people from far away. 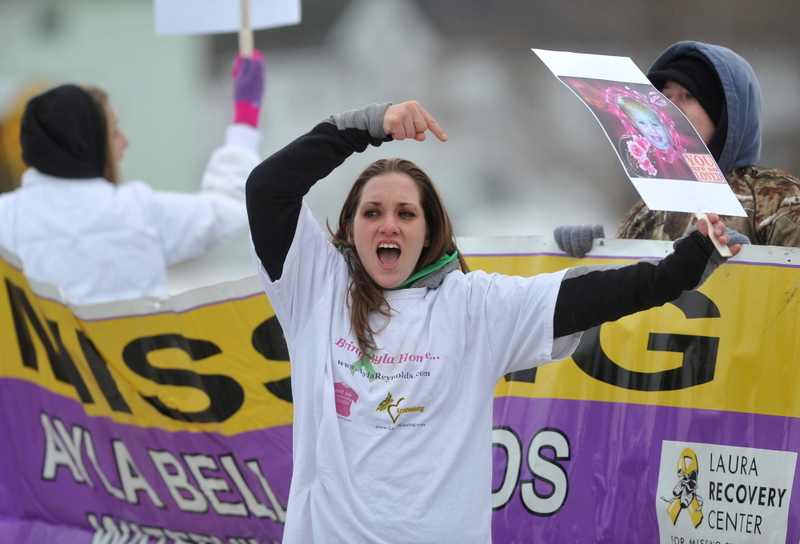 Heather Garczynski drove 13 hours from Erie, Pa., with her children and friends. They call themselves Justice Seekers and say they protest cases where justice has not yet been served. Garczynski, 43, said she has a bachelor’s degree in criminal justice and sociology and is attending graduate school for criminology. 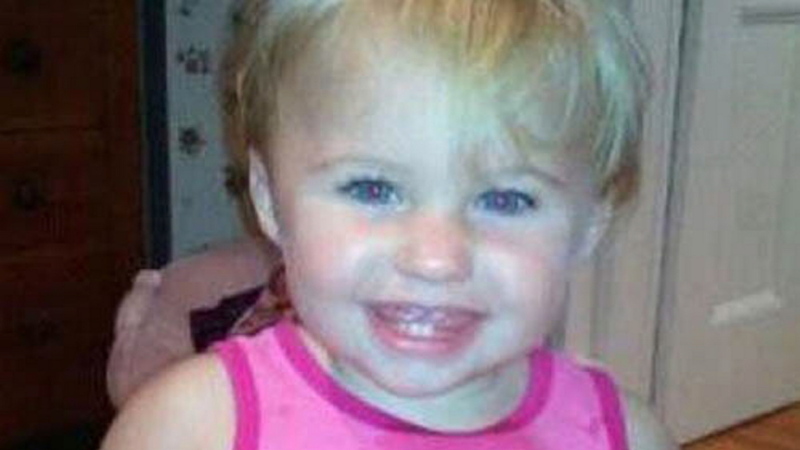 She maintains there is probable cause to file charges in Ayla’s disappearance. “It baffles me that there’s so much probable cause in the case and nothing’s been done and people are allowed to walk the streets without a care in the world and there’s a little girl missing,” Garczynski said. Nancy Emery, 60, of Waterville, said she empathizes with Ayla’s family, as her own daughter disappeared when she was 11 and was not found for two months. Her daughter now is 34. Emery said she thinks those who were in the Violette Avenue home the night Ayla disappeared are culpable. “They should at least be charged with endangering the welfare of a child,” Emery said. She added that the state also shares blame because Ayla was allowed to stay with people who did not keep her safe. 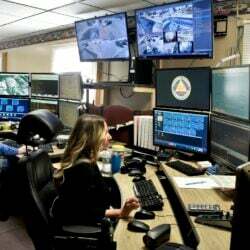 “DHHS (the state Department of Health and Human Services) should be held responsible for what they did,” she said. Conrad Armandi, 64, of Oakland, urged people not to forget Ayla, and to be patient, as the truth will be revealed in time. As a former deputy sheriff, Armandi said he believes authorities are being very careful before charging anyone. 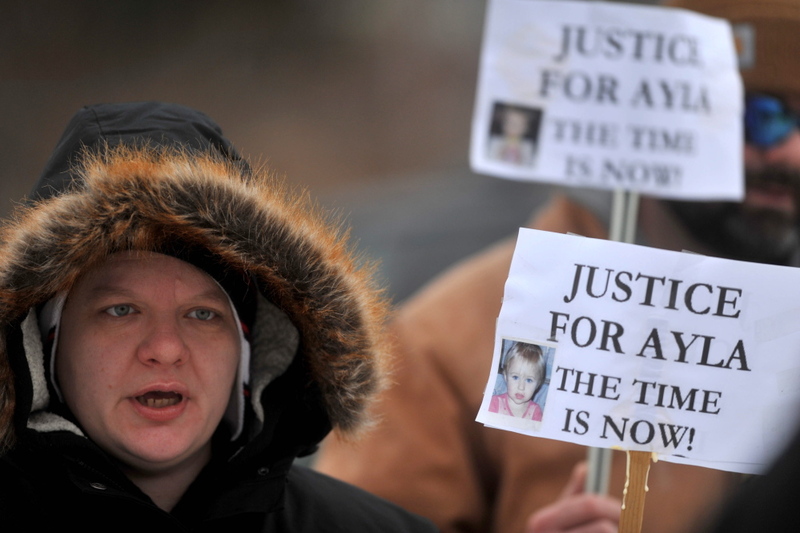 In January 2012, members of Ayla’s family said they were told by police that blood later confirmed to belong to Ayla was found in the basement of the home on Violette Avenue. Trista Reynolds said in September that police told her shortly after Ayla disappeared that blood was found in multiple locations in the home. Police have not commented on or confirmed that. 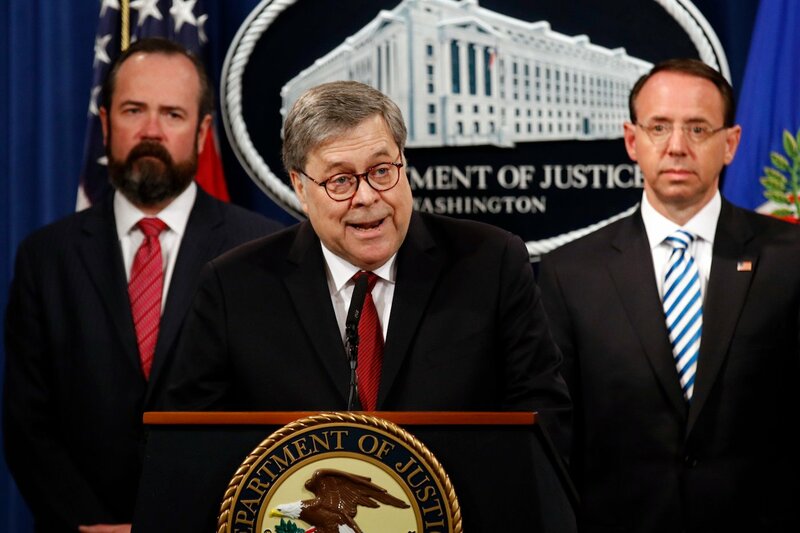 Those organizing Saturday’s protest demanded that the DiPietros and Roberts and anyone else involved in her disappearance be charged and prosecuted. 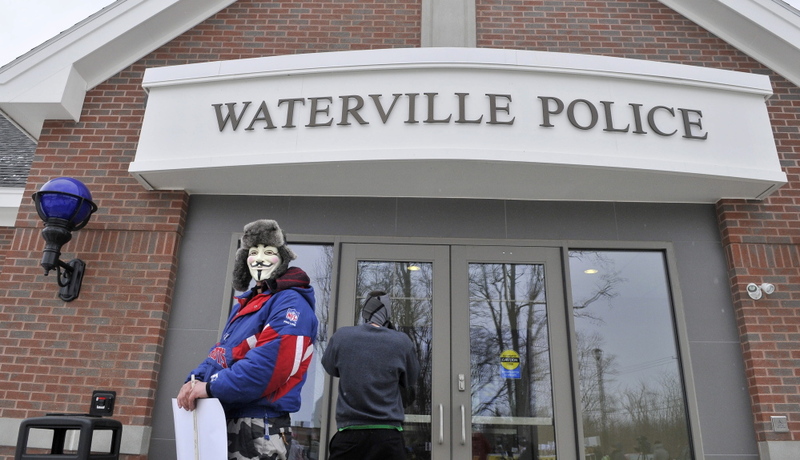 They said they were not protesting against Waterville police, but held the event there because it is a public building and Ayla disappeared in Waterville. Police at one point Saturday came out to ask that some people move cars, but otherwise stayed behind the scenes. Motorists whizzed by, beeping their horns and waving. Ronnie Reynolds Sr. said he is proud of his daughter, calling her a good mother who is trying hard to raise her two young sons. “I never, ever imagined that we would ever have to go through this,” he said. Like Trista and Jeff Hanson, he says he is grateful for everything law enforcement officials have done and continue to do to solve the case. An email sent Saturday afternoon to Justin DiPietro’s mother, Phoebe DiPietro, seeking comment, was not returned. She owns the house from which Ayla disappeared.